MANSFIELD — Akron Children’s Hospital will bring together pediatric primary care, urgent care, nearly a dozen of its most in-demand pediatric specialty care practices, and rehabilitation services in one conveniently-located medical building at 1029 S. Trimble Road when it officially opens next week. The Akron Children’s Mansfield Health Center is one of several such centers planned throughout the region, recognizing the priority parents place on having the highest quality pediatric care for their children in a convenient location, close to home. This 32,400 square-foot center is set to open on March 26. Urgent Care will open a day earlier. Akron Children’s will consolidate services currently offered at multiple Richland County locations in this one location, such as the Akron Children’s Hospital Pediatrics (ACHP) offices on Balgreen Drive in Mansfield and Fourth Street in Ontario. The public is invited to tour the new facility Saturday, March 23 from 9:30 a.m. to noon. This event is free and will include family entertainment, a scavenger hunt for kids, a raffle and light refreshments. The ribbon cutting is at 11 a.m. When patient families enter the building, they will immediately notice an abundance of natural light, and the child-friendly colors and artwork, including a whimsical audio-kinetic sculpture by contemporary artist George Rhoads, whose “Incrediball Circus 2” has delighted children in the lobby of Akron Children’s main campus for nearly three decades. Wall murals pay homage to Richland County’s character and charm with images of farmland, race cars and a carousel. Akron Children’s Hospital Pediatrics: This pediatric primary care practice – blending the two existing Richland County ACHP offices — is a medical home for babies, children and teens staffed by board-certified pediatricians, nurse practitioners and pediatric nurses. The practice also has a full-time mental health specialist, available to help with concerns such as depression and anxiety. The phone number is 419-522-3341. Pediatric Specialty Care: Pediatric specialists in allergy/immunology, cardiology, gastroenterology, hemostasis and thrombosis, nephrology, orthopedics and urology will be available at this location with convenient access to diagnostic tools such as cardiac ultrasound, x-ray, echocardiography and EKG. Each specialty will see patients on regularly scheduled days and times by appointment only. Maternal Fetal Medicine: Akron Children’s Maternal Fetal Medicine Center cares for women during high-risk pregnancies. This includes women at risk due to advanced maternal age, diabetes, obesity or a chronic health condition, as well as when the baby is diagnosed with spina bifida, congenital heart disease or another condition that requires special care during and immediately after birth. Radiology and Laboratory Medicine: Whether it is taking an X-ray on an infant or drawing blood from a toddler, radiology and lab clinicians always take a child-friendly approach, while following pediatric best practices such as using the most minimal dose of radiation according to “Image Gently” guidelines. Rehabilitative Services: Akron Children’s team of physical, occupational and speech therapists help children get back to the things they love to do after surgery, cancer treatment, or a traumatic injury. They also help expand skills and improve quality of life for children with chronic illnesses. With all types of toys and special equipment, this work space is fun and “gym-like” with special zones for fine and gross motor therapies, speech therapy and children who need help with sensory integration. An indoor track connects to an outdoor path for patients learning or re-gaining skills with walkers, trikes and bikes. The Akron Children’s Health Center in Mansfield is the first of three such centers to open in 2019. The other health centers are under construction in North Canton and Boston Heights. A fourth is planned for Portage County. Photo courtesy Akron Children’s Hospital Akron Children’s health center in Mansfield opens next week. The 32,350 square-foot facility will offer an array of services for babies, kids and teens. It is located at 1029 S. Trimble Road, Mansfield. 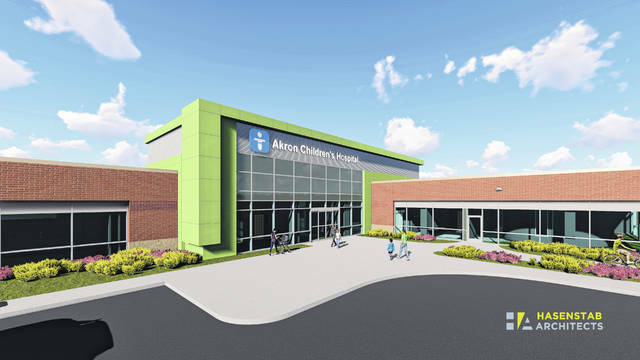 https://www.thebellvillestar.com/wp-content/uploads/sites/39/2019/03/web1_Mansfield-NW1.jpgPhoto courtesy Akron Children’s Hospital Akron Children’s health center in Mansfield opens next week. The 32,350 square-foot facility will offer an array of services for babies, kids and teens. It is located at 1029 S. Trimble Road, Mansfield.